These divisions only deepened under Stubb’s leadership; he later admitted that he had contemplated calling for a snap election in the autumn of 2014. [iii] The coalition did make it to the end, of course. Though not before another junior party in the form of the Green League (GL) had walked out in protest to the government’s nuclear policy. And not before the relationship between the NCP and its senior partner, the Social Democratic Party (SDP), had deteriorated to the point at which it is difficult to imagine the two parties ever sharing government responsibility again. Looking back, sticking it out may well have been the greatest achievement of the Katainen-Stubb government. A more cynical observer might even say that this was its only achievement. After all, the cabinet had originally set out to implement an extensive coalition programme spanning some 140 pages. In it, the parties promised a number of structural reforms that would tackle major challenges facing Finland—most notably, a rapidly aging population and an economy weakened by the ongoing Euro-crisis. Three overarching goals were set: the reduction of poverty and inequality; consolidation of the state budget; and the creation of conditions that support long-term economic growth and employment. Four years later, little progress can be discerned on any of these fronts. The government did manage to work out a pension reform in collaboration with the labour market organisations in 2014. Yet all other reforms were either buried or postponed during the last weeks of the parliamentary term. The municipal reform that intended to streamline local governance was the first to go after coming under fire from the opposition. Then the so-called „family package“ was abandoned, after both the SDP and the Christian Democrats (CD) came out against the proposed changes to parental leave and day-care in early February. Also the government’s pet project, the health and social care reform, was put on hold when the planned changes were declared unconstitutional by the parliament. The farce finally culminated in the last session of the parliament as the whole government—save one MP—voted against its own motion on an educational reform. It now falls upon Stubb’s successor to draft and implement the structural reforms the country so badly needs. More important than the changing electoral fortunes of the individual parties, however, was the effect that the 2011 elections and the „jytky“ in particular had at the compound level. 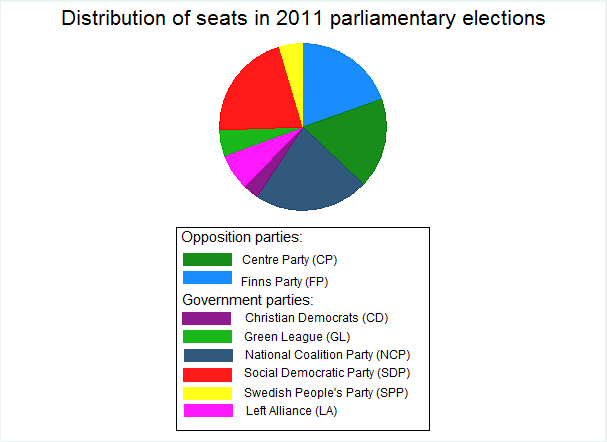 As illustrated by the graph below, the Finnish party system has traditionally been an extremely stable one, with the three large parties—the CP, the NCP, and the SDP—typically dividing some 65 per cent of the valid votes between them and the rest going to the two medium-sized parties—the GL and the LA—and the three smaller parties—the CD, the FP, and the SPP. The 2011 polls clearly broke these established patterns: suddenly, there were four large parties with only marginal differences in their electoral strength. These results put the parties in a new political situation. On the one hand, the lack of a clear-cut majority interfered with established patterns of government formation. Finnish governments have long been formed between two of the larger parties with the support of two intermediate or small parties. The remaining large party has then gone on to become the opposition leader. On the other, the indecisive election results also increased political unpredictability. The loss of seats had been an unnerving experience for all the established parties. Now, they were facing the need to re-establish themselves amongst their core electorates so as to stop bleeding votes to the FP. This presented the newly chosen government parties with a dilemma. During the next four years, they would be expected to put up a common front against the opposition. At the same time, they would have to court their voters in preparation for the next elections. Two factors eventually tipped the scales in favour of the latter goal. First, the coalition programme did little to encourage the parties to switch off their „election campaign mode“. In trying to cater to the goals of all participating parties, the programme almost invited conflicts of interest. And because each party would stubbornly try to push through its own agenda as agreed upon in the programme, the programme undermined incentives to compromise. It is against this backdrop that we can make sense of the Greens‘ and the Left Alliance’s exit: once it became clear that the parties would not be able to stop new investments in nuclear energy and cutbacks in social welfare respectively, the parties rather marched out than give up their core demands. Second, the turn away from government cooperation and towards electoral competition was driven by leadership changes within the parties. This aspect was particularly important with regard to the relationship between the two senior government parties. When the coalition first took office, there was close collaboration between Prime Minister Katainen and SDP chair Urpilainen, who also held the office of Finance Minister. With Stubb taking over the leadership of the NCP and Rinne ousting Urpilainen in 2014, all this changed. Finance Minister Rinne in particular has been keen to boost the low approval ratings of the SDP and his attitude towards his coalition partner has been much more confrontational. The SDP has now taken to challenging the NCP by calling for more fiscal stimulus instead of increased austerity measures—a policy that might be expected to appeal to the social-democrats‘ core electorate. The response of the NCP has been to accuse its coalition partner of trying to water down agreed-upon budget cuts and undermining mutual trust within the government. As a result of this bickering, the relationship between the two parties has come to resemble a war of attrition. This in turn has effectively incapacitated the government. Have we seen the end of consensus politics in Finland? With Finnish voters preparing to hit the polls to elect a new parliament in less than a week’s time, let us end by turning our attention to the future. 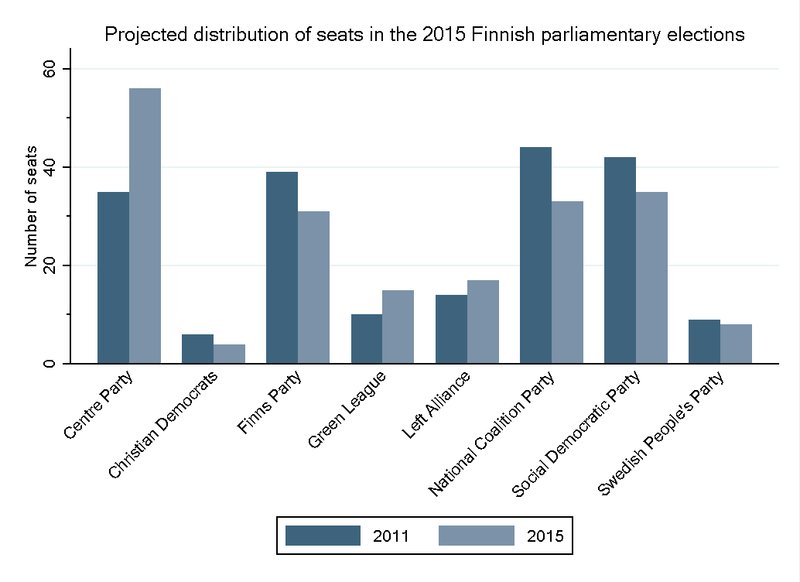 What impact will the past parliamentary term have on Finnish politics in the longer term? Is the country likely to make its way out of the current political stalemate? Or is this the end of consensus politics as we know it? A look at one of the most recent opinion polls carried out in March suggests that the last four years will leave a mixed political legacy. On the one hand, some recent dynamics are likely to prevail. We may expect to see a clear backlash from the electorate in terms of the actual outcome, with their time in government being predicted to cost the NCP and the SDP anything between six to ten seats each. At the same time, the FP appears to be here to stay, as it will more or less retain its share of parliamentary seats. 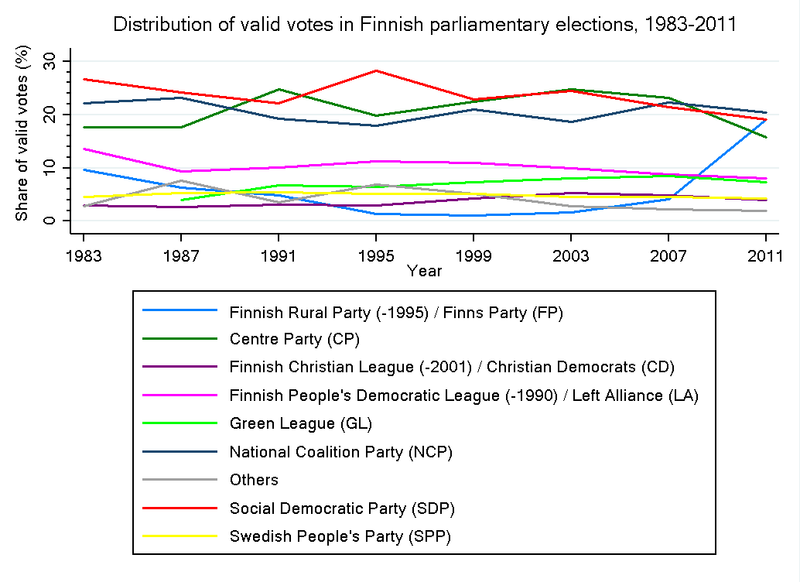 This indicates that the recent changes to the Finnish party system are of a more lasting nature, with the system being now one of four rather than of three large parties. By implication, we may expect to see the parties continue to experiment with new types of government formulas. On the other, some of the recent developments appear to be coming to a halt. For one thing, there will be a clear winner this time around, with the CP being firmly on track toward becoming the largest party with a comfortable 56 seats. The party is profiting from the general voter disenchantment with the government parties. Yet it also benefits from the public image of its new leader Sipilä, whose successful background in business appeals to the wish of many voters for more concerted leadership. By virtue of its majority, there is hope that the CP will prove a stabilising factor in the upcoming government negotiations as the party may put its weight behind either a centre-left or centre-right cabinet. In either case, the ensuing government is likely to prove ideologically more coherent than its predecessor. Most importantly, however, there is evidence that the parties themselves have learnt something from the debacles of the last years. In remarkable unison, all the large parties have by now pledged themselves to reducing public spending and implementing the structural reforms that are required to resuscitate the Finnish economy. With the parties united behind this goal, the major difference between a prospective centre-left and centre-right coalition seems to lie in the choice of measures with which these reforms are to be carried out. Thus, there may be hope for consensus still. [i] The Financial Times, 07.04.2015. [ii] Originally, the coalition comprised the NCP, the Social Democratic Party (SDP), the LA, the Green League (GL), the Swedish People’s Party (SPP) and the Christian Democrats (CD). [iii] The Financial Times, 07.04.2015. [iv] The word „jytky“ is originally a dialectal expression indicating a big bang or kaboom. Soini was the first to use this term to refer to an overwhelming electoral victory. Dieser Eintrag wurde veröffentlicht in Allgemein, Demokratiequalität, English posts, Forschungprojekte, Parteien, Wahlforschung und verschlagwortet Finnland, Parlamentswahlen 2015 von saara. Permanenter Link des Eintrags.